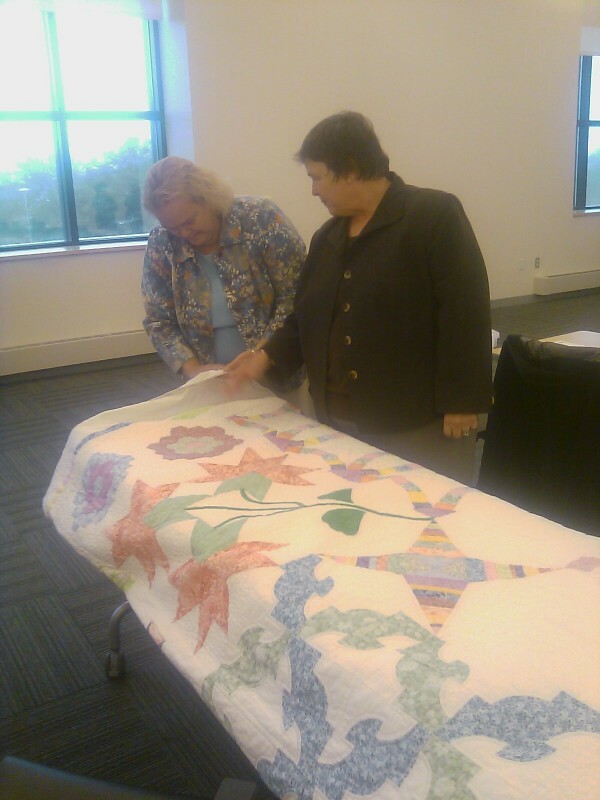 Bangor lawyer Roberta Winchell (right) shows Lincoln lawyer Patricia Locke the quilt the family of an elderly client made for Winchell at the Penobscot Judicial Center on Monday where both lawyers received the Katahdin Council Award from the Maine Supreme Judicial Court. 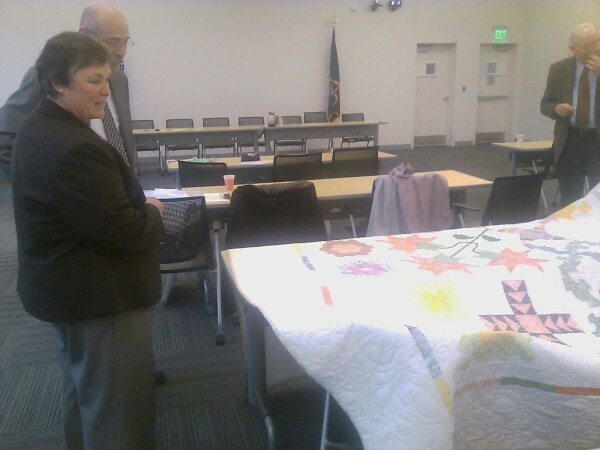 Bangor lawyer Roberta Winchell (left) shows Maine Supreme Judicial Court Justices Jon Levy (middle) and Donald Alexander (right) the quilt the family of an elderly client made for Winchell in thanks for her free legal work. BANGOR, Maine — Two days before Roberta Winchell’s client died Sept. 14 at the age of 90, she told Geraldine Hoxie that she would always be her lawyer. Hoxie, who lived most of her life in East Millinocket, never paid Winchell to represent her in legal matters that led to the conviction of Hoxie’s daughter for stealing her mother’s retirement money. Winchell took the woman’s case three years ago for free, or pro bono. On Monday, Winchell of Bangor was one of more than a dozen lawyers in Penobscot, Piscataquis and Hancock counties who donated over 50 hours of free legal services to clients in civil cases between July 1, 2012, and June 30, 2013, to receive the Katahdin Council Award from the Maine Supreme Judicial Court. Winchell was the only lawyer who arrived at Penobscot Judicial Center with an entourage and a quilt. Hoxie’s son, William Hoxie, his wife, Pam, both of Lincoln, and Pam Hoxie’s mother, Helen Foster of Medway, accompanied Winchell to the brief ceremony. Winchell brought along the quilt Foster made to thank the lawyer for all her help. In 2011, William and Pam Hoxie went to Winchell for help and legal advice when they discovered that their mother’s retirement account had been cleaned out by her daughter, Meredith A. Purcell of East Millinocket. Winchell consulted with Assistant Attorney General Leanne Robbin, who prosecuted Purcell. Purcell was sentenced to four years in prison with all but four months suspended after being convicted of theft by unauthorized taking and misuse of entrusted property between 2007 and 2011, according to a previously published report. Two years ago, the state supreme court created the Katahdin Council Award to recognize lawyers around the state who donate legal services to clients who can’t afford to pay them, Chief Justice Leigh I. Saufley said Monday. “There is a crisis today in courts across the country, and Maine is no different,” she said. “The law can be complex, and stressful for those caught up in legal issues. Understanding and navigating the legal system without professional help can be even more difficult and more stressful. Access to lawyers in civil cases is crucial to making equal justice a reality for all. This year, more than 140 lawyers will be recognized for donating more than 14,286 hours to clients, according to Saufley. If billed at the state average of $150 per hour, the value of that legal service would be $2.142 million. Others who received the Katahdin Council Award were: Eric Columber of Ellsworth; Heather Staples of Ellsworth; Deborah Meier Carr of Greenville Junction; Audrey Bryant Braccio of Bangor; Zachary Brandmeir of Bangor; Kerry Clark Jordan of Orono; Jane S.E. Clayton of Bangor; Angela Farrell of Bangor; Patricia Locke of Lincoln; Cynthia Mehnert of Bangor; Eric M. Mehnert of Bangor; Martha Novy-Broderick of Lincoln; Logan Perkins of Bangor; Jane Skelton of Bangor; and Joy A. Trueworthy of Bangor. Similar events to honor lawyers in other parts of the state are being planned, according to Hanna Sanders, access to justice coordinator, for the Maine Supreme Judicial Court.